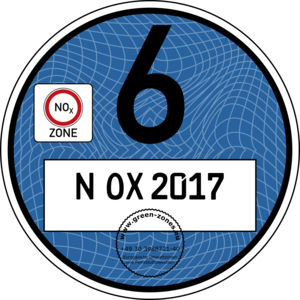 Inform yourself now about the German Blue NOx Badge! Light blue or dark blue – In any case, the Blue Badge arrives! The Blue Badge – it is light blue or dark blue – In any case, it is blue! The driving bans for diesel vehicles have arrived! Health goes before Mobility! On 27.02.2018, the Federal Administrative Court decided that diesel driving bans are legally applicable in particularly polluted city centres. In Leipzig, the revision procedures of North Rhine Westphalia and Baden-Württemberg have been approved. It is now clear that diesel vehicles producing high levels of nitrogen oxides can be banned from traffic. It remains to be seen in the coming weeks how this measure will be enforced. Anyway, in future, highly polluting vehicles have to be distinguished from clean vehicles. How these restrictions will be implemented in Blue Zones, it is already evident. There are different possibilities of using these restrictions: Should bans be permanent and applied to all vehicles? Should only the commercial traffic be banned or just this not? Could driving bans be applied temporarily in case of air pollution peaks, as the neighbouring France does? 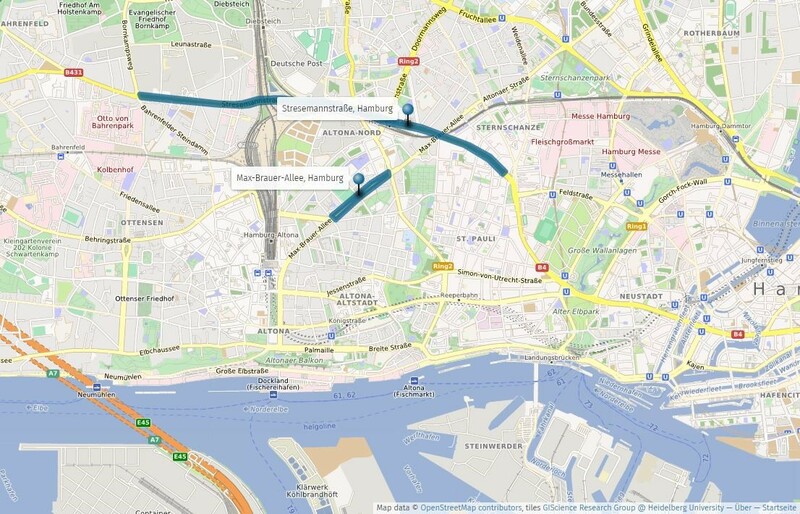 In any case, the city of Hamburg has already set a good example and has decided to introduce diesel restriction zones by the end of May 2018. 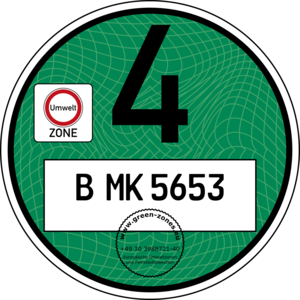 Find out here which badges are required in these zones. In Germany, the year 2018 has become the year of decisions on diesel driving bans. 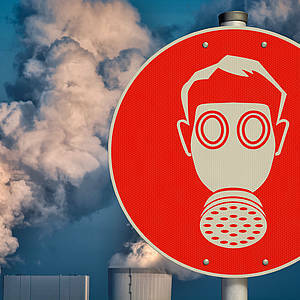 The German Association for the Environment (DUH - Deutsche Umwelthilfe) has sued numerous German cities and won as they have exceeded the air quality limits. 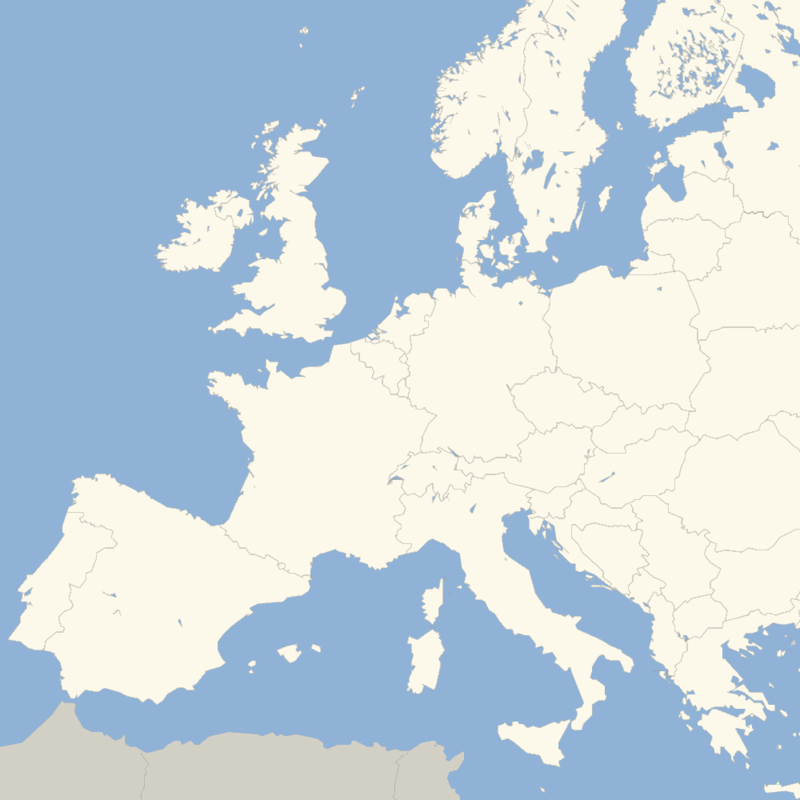 The cities of Aachen, Frankfurt am Main, Cologne, Bonn, Mainz, Essen, Gelsenkirchen and Berlin were obliged by the courts to introduce driving bans. It all began with the fundamental decision before the Federal Administrative Court in February 2018, which declared diesel driving bans possible, as long as they were proportionate. After this judgement, Aachen was the first city for which a judge declared diesel driving bans on polluted road sections. Diesel driving bans were to be introduced there from January 2019, but the city of Aachen decided to appeal. Previously, the city of Hamburg – without waiting for a court judgement – had already voluntarily imposed a diesel driving ban on two main roads at the end of May 2018. On 05.09.2018, Frankfurt am Main was then condemned to the introduction of diesel driving bans and announced first to impose driving bans within the entire existing environmental zone. In view of the state elections and after planning further measures for air pollution control, it remains to be seen whether and when diesel driving bans will be introduced in Frankfurt. On 09.10.2018, the Administrative Court of Berlin ordered that diesel vehicles of EURO 0-5 classes will be banned from 8 heavily polluted roads. The Administrative Court of Mainz decided on 25.10.2018 that the efforts of the city Mainz were not sufficient and driving restrictions had to be introduced. As a result, Mainz could become the first German city to adapt its driving bans individually to the current measured values, similar to France. 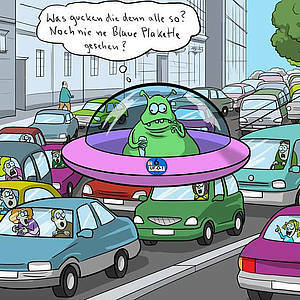 With this particular solution, the already existing confusion among Germany’s motorists would be perfect. On 08.11.2018, Cologne and Bonn were jointly obliged to introduce diesel driving bans. Essen and Gelsenkirchen followed on 15.11.2018, whereby here a driving ban on the A40 highway, which leads through the city area of Essen, was imposed for the first time. On 21.11.2018, after a long court hearing, the decision on the case of the city of Darmstadt was postponed to 21.12.2018. The judgment is thus dependent on the decision on diesel driving bans in Wiesbaden, which is scheduled a few days before. You can always read the latest news about all further developments on our website! Light blue for diesel EURO 4-6ab, dark blue for diesel classe EURO 6d-Temp. 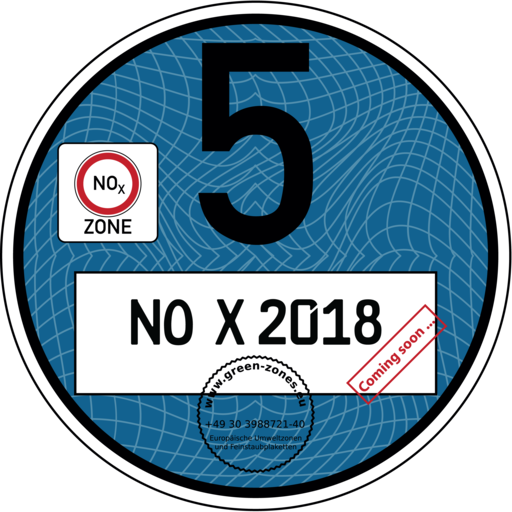 The Federal Environmental Agency is considering introducing two new badges to label vehicles that have low nitrogen oxide emissions. One badge is not enough, since the latest diesel engines still emit more nitrogen oxides than permitted, because they were subject to exhaust gas manipulation. 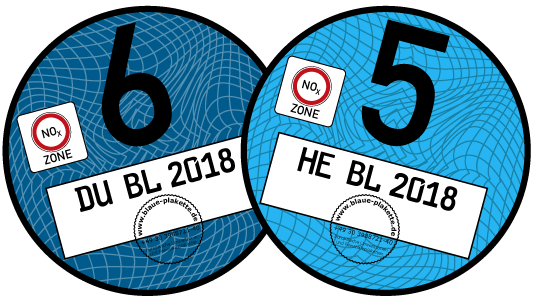 For this reason, there could soon be two blue badges: a light blue one for retrofitted EURO 5 diesel and already approved EURO 6 diesel, and a second dark blue one for the latest EURO 6 and 6-Temp diesel. However, this second, dark blue badge is only to be used in relatively small and heavily polluted areas. This would also facilitate the gradual introduction of driving bans as stipulated by the Court in Stuttgart. All details about who receives which badge can be found here. On 05.09.2018, the Administrative Court of Wiesbaden decided on diesel driving bans for the city of Frankfurt. In Frankfurt, limit values for nitrogen oxide have been exceeded for many years. Although a positive trend has been observed since 2000 and air pollution is decreasing, it still remains above the permitted limits introduced to protect public health. For this reason, the German Environment Aid (DUH) sued the Land of Hesse for the review of their Clean Air Plans. The responsible judge has now ruled that from 01.02.2019, diesel vehicles with EURO 4 standard or less and petrol vehicles with EURO 1 and 2 classes are no longer allowed to drive in. From September 2019, EURO 5 diesel vehicles will also be excluded from the environmental zone. Therefore, the judgement is in line with the decision of the Federal Administrative Court, according to which driving bans for EURO 5 diesel vehicles before September next year are disproportionate. Before the hearing, the city of Frankfurt stated that it would not consider introducing individual driving bans on few roads. It is expected that driving bans will be imposed on the entire existing green environmental zone. 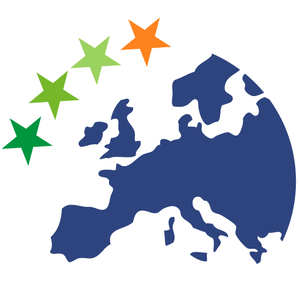 Green-Zones, the information portal for European environmental zones, compiles all the relevant information and current statements on diesel bans here in the website Blaue Plakette. Information from the Federal Environment Agency, implementation need following the Court’s decision in Leipzig, information from the planning documents of the cities sued by DUH are summarized here. This results in practical rules, concrete EURO classes as well as interactive and zoomable maps. Stuttgart is one of the cities that wants to introduce a diesel restriction zone in 2018. This year, all diesel vehicles with a EURO standard below 5 will be excluded from traffic. From 2019, vehicles with a EURO 5 standard could also be excluded. From 2022, further restrictions are planned. The exact extent of the blue environmental zone, which is divided into 22 individual zones, can be viewed in the version 9 of May 2017 in the Green-Zones App and on the website Blaue-Plakette.de. 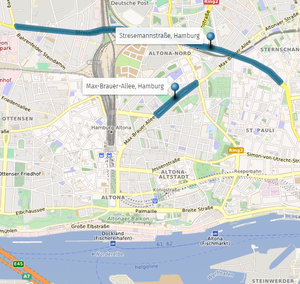 The Hamburg blue environmental zone is less fragmented but its rules are just as complicated. It is only divided into two parts, but already has different access rights for both zone sections. In the area of Stresemannstraße, only diesel trucks with EURO standards 0-5 are affected by the driving ban, passenger cars (diesel/petrol) may still enter the zone without any restriction. In the Max-Brauer-Allee, however, no diesel vehicles are allowed to drive through. Diesel driving bans confirmed by the Supreme Administrative Court in Leipzig on 22.02.2018! 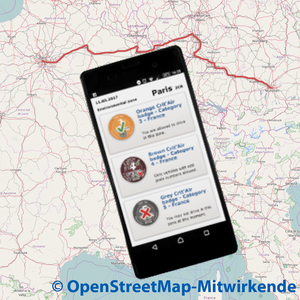 – The App on diesel driving restrictions is now available for free! The lawsuit for better air pollution control and diesel driving bans in Stuttgart and Düsseldorf, which was initiated by the German Environmental Aid DUH, has been confirmed by the Federal Administrative Court in Leipzig on 22 February 2018. It can now be assumed that, in the medium term, not only Stuttgart and Düsseldorf, but also at least 10 other German cities will be subject to diesel driving bans on certain roads/zones. Since this is a very complex decision, it will be necessary to await the written reasons of the judgment. In any case, it can be expected that the market value of diesel vehicles will continuously fall. Also, it will become harder and harder for drivers to know in which zone they can enter with there vehicle and where they cannot. More information about the diesel driving bans are here. It is recommended to use the Green-Zones App in order to recognize, bypass or drive through the permanent or temporary diesel low emission zones being set up in the cities. Information about the Green-Zones App is available here. Direct download for Android and iOS in 9 languages in the Play-Shop or App-Store. Diesel bans are planned in Hamburg, Düsseldorf and Stuttgart. Other cities may be added or not: Clean diesel vehicles must be distinguished from dirty diesel vehicles and these must also be distinguished from petrol and electric vehicles. For more than a year now, this issue has been evident both among experts and the general public: This is only possible with the blue badge. Therefore, the Federal Environment Minister Hendricks announced some time ago: „Vehicles equipped with a retrofitting and allowed to drive, must also be labelled!” An awareness that the CSU-led Ministry of Transport has not yet achieved.